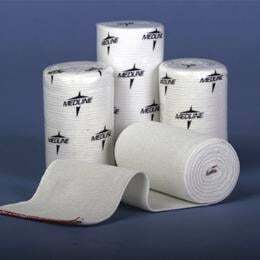 Swift-Wrap Elastic Bandages: High Quality Rubber Elastic Bandage With Convenient Velcro® Self-Closure, Eliminating The Need For Clips Or Tape. Cotton/Polyester Knit Construction, Ideal For High Compression Treatment On A Variety Of Conditions. Sterile ' 6" X 5 Yards Stretched, White.